The kakapo is flightless and is the largest parrot by weight in the world, at up to 3kg. Male-upperparts green with irregular barring and mottling to the plumage, colours black, brown and yellow; underparts green/yellow, irregularly barred pale yellow and brown; yellow/brown facial disc; outer primary feathers tipped with yellow; tail green/brown with yellow barring and black flecks. Bill grey tipped pale grey/white; eye dark brown. Female-smaller in size, with smaller bill; outer primary feathers tipped green/brown. As in adult but generally duller in colour; forehead and facial disc less prominent and more brown; outer primary feathers pointed, not rounded tips. Bill yellow/white. Wide variety of squeals, shrieks, sounding like a pig; also donkey-like braying. Repetitious bell sounds. Booming by males during mating season (“lek” display) is repeated 15-20 times at intervals of 2 seconds apiece, continued for many hours. The only birds in captivity are those raised in the Kakapo Recovery project. 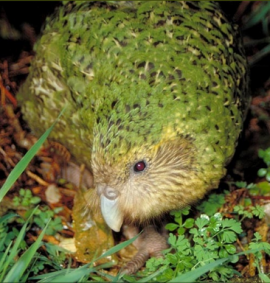 In the wild, kakapo may live 30-50 years, and take 8-10 years to reach breeding age. Birds on Pearl, Whenua Hou and the other islands have been supplemented with freeze-dried or frozen rimu fruits, green walnuts and pine conelets, and a complete pellet. Decline due to habitat degradation and clearance, as well as introduction of predators such as stoats and cats. Birds were relocated to the various islands mentioned to escape these threats. Restricted (translocated) to Maud, Inner Chetwode, Pearl and Codfish Islands, New Zealand. Ground dweller of forest substrate and low scrubland. Formerly from sea-level to 1200m (3936 ft). Feed on leaves, roots, fruits, ferns, mosses, fungi and seeds. Food species include pink pine, stinkwood, rimu, Hall's totara and mountain flax. Also supplementation in the form of freeze-dried and frozen Podocarp fruit, green walnuts and pine conelets, as well as a complete pellet. Are lek breeders-males clear track and bowl systems where small bowl shaped areas are linked by pathways, often up on ridges where sound will carry. From there, at night, the booming sounds of the males carry far and wide to attract females. Booming may be stimulated by an abundance of pollen early in summer, indicating that sufficient food will be available for families. Normally solitary outside breeding season. 2 to 4 ovoid eggs, more pointed at one end, 50.5 x 36.5mm (2 x 1.4 in).